"Ninety-four percent of all stuffed peppers are made because there's leftover rice around. You can adjust this recipe in lots of different places: the herbs, the meat to use, etc. 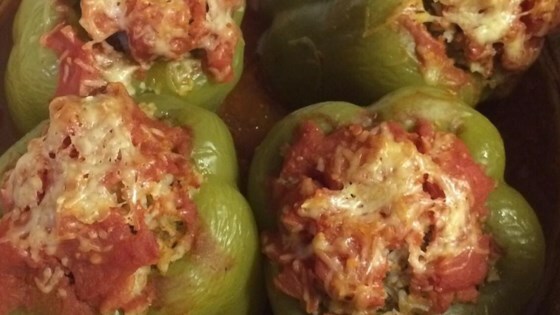 Give these beautiful stuffed peppers a try!" Slice the top 1/2 inch from the tops of peppers and cut out the stems from the tops. Cut the core from the inside of the peppers and strip away any seeds. Cut away a very thin slice of pepper from the bottoms so the peppers can stand upright. Poke about 4 tiny holes in the bottoms to let juices drain out. Pour 2 1/2 cups tomato sauce into a 9x13-inch baking dish. Add onion, beef broth, and red pepper flakes; spread out mixture evenly over the bottom. Set prepared bell peppers upright in the dish. Combine ground beef, cooked rice, Parmigiano-Reggiano cheese, 1/4 cup parsley, 2 tablespoons tomato sauce, garlic, salt, and black pepper in a large mixing bowl. Lightly stuff peppers with meat mixture. Spread 1 tablespoon remaining tomato sauce on top of each portion of stuffing; place reserved tops onto peppers. Lay a piece of parchment paper loosely on top of peppers and cover dish tightly with foil. Lay dish on a baking sheet. Bake in preheated oven for 1 hour. Peppers should be starting to soften. Remove foil and parchment paper. Continue to bake until meat filling is cooked through and the peppers are tender, 20 to 30 more minutes. Sprinkle each pepper with 1/2 teaspoon parsley and drizzle with a spoonful of pan juices. Any ground meat works. Lamb, pork, or half sausage and half beef is fantastic. I used all lean beef but suggest you try 1 pound beef with 1/2 pound pork sausage. I put a piece of parchment paper down just because I don't like foil touching acidic things while they bake. If you don't use the sheet pan, your peppers are going to take less baking time. This is a great recipe. I used ground turkey and italian turkey sausage instead of beef. The turkey is lower in fat which offsets the addtional cheese that I add.